Wireless home security camera system. Keep an eye on what goes on in and around your home or business with this home security camera system from Lorex. With 4 digital wireless cameras and a 7-inch LCD monitor, this is the perfect easy setup, no hassle video monitoring solution. Lorex LW491 is an easy to install video monitoring for home. Home monitoring simplified: no video cables, no expensive installation, no recurring fees. Place the cameras indoors or outdoors, power up, and start monitoring! Buy this Security System and Save 55% Off on 4 Camera Wireless Home Security Camera System Now Only $357.85 with promo code PROTECT15 at Lorextechnology.com! HD NVR security camera system with 4 HD IP cameras. The Lorex NVR200 Series High Definition Security Camera System features the latest advances in IP camera technology. This complete video surveillance solution includes everything you need to enhance your business or home security. The Lorex IP camera system is easy to setup - extra power cables are not required. Plug the IP cameras into the Ethernet PoE ports and turn on the NVR unit. The cameras will be discovered automatically, and the system will start recording immediately. The NVR2411T Series Security Camera kit includes: 4 channel NVR with a pre-installed hard drive and built-in 4 channel PoE switch; 4 High Definition 1080p IP security cameras with mounting hardware and 100ft Ethernet cables. Buy this Cameras and Save 58% Off on HD NVR security camera system with 4 HD IP cameras Now Only $594.99 with promo code PROTECT15 at Lorextechnology.com! Save 45% Off on HD 720p Security System with 4 HD Cameras. HD 720p Security System with 4 HD Cameras. Experience the gold standard in analog surveillance video that is second only to being there yourself. This HD DVR records video in real-time at 720p HD, double the resolution of 960H, on all 4 channels. Including 4 fully-loaded megapixel security cameras, this system uses standard BNC cabling to transmit stunning HD images for a surveillance experience like no other. Maintain vigilance with best-in-class image quality and view your world with new eyes. 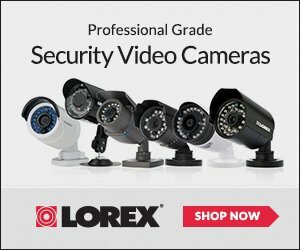 So buy this Cameras and Save 45% Off on HD 720p Security System with 4 HD Cameras Now Only $365.49 with promo code PROTECT15 at Lorextechnology.com! Save 50% Off on Outdoor Wireless Security Camera System. Save 66% Off on 7 Inch Display Video Baby Monitor. Video baby monitor with large 7 inch display. The newest addition to the LorexBaby family: the illustrious STAR BRIGHT Video Monitor. With its enlarged screen and user-friendly menu, this unit is the ideal tool for parents seeking a brilliant support system at home. LorexBaby�s brilliant STAR BRIGHT comes fully equipped with Crystal Clear Night Vision, Crisp Sound, and a 7� LCD Monitor. This no-nonsense unit will guide new parents through days and long nights with their little ones. Our easy-to-use navigation is uncomplicated for a reason � we love providing caregivers with one less thing to worry about! The Soothing Lullabies, Built-In Nightlight, and Two-Way Talk are for your baby�s utmost comfort, but the heaven-sent STAR BRIGHT is for yours. So buy this and Save 66% Off on 7 Inch Display Video Baby Monitor For Only $101.99 with promo code PROTECT15 at Lorextechnology.com. Get FREE SHIPPING on Orders $3.99 or More. Summer Clearance Event! Up to 65% Off at LorexTechnology.com! Summer Clearance Event! Save Up to 65% Off at LorexTechnology.com! Use coupon code: PROTECT15 at checkout. While supplies last. So Shop Now.